Elena is a contemporary and spacious split level, two bedroom apartment within the stunning Elvina complex, with its unique cascading swimming pool inspired by the terraced pools of Pammukale. With south facing views and a generous wrap around private sun terrace, the apartment enjoys sunshine all day long. There is direct access from the apartment terrace into the 46m swimming pool, so the water is never more than a few steps away. 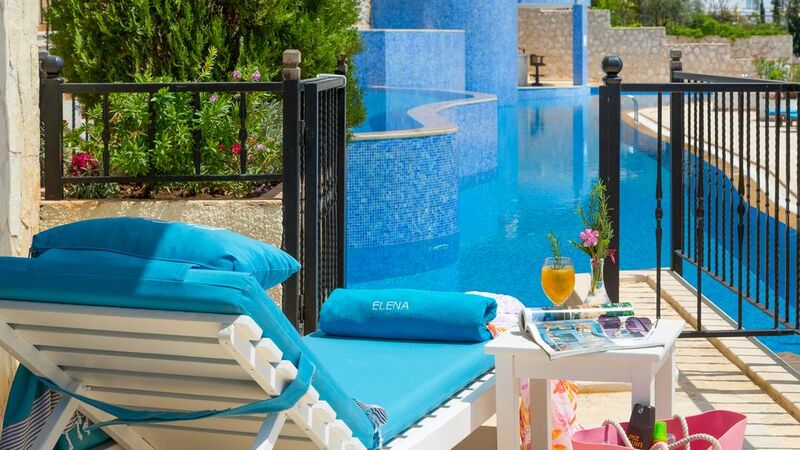 The Elvina Apartments are located in the Ortaalan district in Kalkan, which is east of the town centre and easily walk-able into Kalkan's Old Town (12-15 minutes). At ground floor level the apartment offers open plan living with a large and comfortable L-shaped sofa bed in the living space, a dining table to seat 6, a modern and fully equipped kitchen plus a shower room. On the first floor there are two spacious bedrooms, both with a balcony and sea view, plus a second shower room. A home away from home, Elena has all the mod cons you need to make your stay enjoyable and effortless, including wireless internet access, air conditioning, satellite TV, DVD player, washing machine, dishwasher, microwave, fridge/freezer, oven, toaster, hair dryer, iron and ironing board. Our names are Nikki and Konrad Empacher. We first went on holiday to Kalkan in May 2009 and were hooked instantly. So much so that we decided to buy an apartment the following year and haven't looked back. On 18th May 2011 we were married in Kalkan and had a wonderful week with family and friends. Then on 18th May 2013 we were thrilled with the arrival of our little boy, who has since travelled with us to Kalkan and loved every minute of it. Kalkan is a home away from home for us and I don't think we will ever get tired of going there. We like the location of the property as it is bathed in sunshine all day long with some great views. It is easily walkable into town, with some local shops and restaurants also nearby. It is one of 16 apartments in a very unique complex with a stunning cascading pool. We love our apartment because it has a great private sun terrace with sunshine all day long and private access into the swimming pool for when you need to cool off. We love open plan living and al fresco dining at home, but also being within walking distance from Kalkan for when we want to dine out or go shopping. Both shower rooms are contemporary and fully tiled. One shower room is on the ground floor and the other is on the first floor. There is a hair dryer in the shower room on the 1st floor. The living room is open plan with a large L-shaped double sofa bed. There is a 32" flat screen TV with satellite and a DVD player. The living area opens onto the private wrap around terrace. The dining area has a dining table with seating for 6 people. Outside: There is a private wrap around sun terrace that enjoys the sunshine all day long and has direct access to the swimming pool for when you need to cool off. The terrace is a fabulous feature of the property and has an outdoor dining table and chairs plus 2 sun-loungers and a parasol. There is also a large communal area in the Elvina complex with more sun beds and parasols. Utility Room: There is a washing machine, iron, ironing board and clothes horse available for your use. Cleaning / Towels / Linen / Maid service: The property is cleaned before you arrive. We provide all bed linens, bath towels, pool towels and bed coverings. Dalaman Airport is the nearest airport and is about 1 hour and 45 minutes journey in a private transfer. Car hire from the airport is also possible. It is a 12-15 minute walk downhill into Kalkan town centre. Kas, a slightly larger port town, is about 25 minutes drive. The biggest town nearby is Fethiye, about 1 hour's drive north of Kalkan. Changeover Day: Bookings are made in weekly periods, Monday to Monday, however we may be able to be more flexible on occasion.